From the author: Through my extensive experience, I have learned that the extraordinary claims made by the “ex-gay” groups are without merit and the efficacy of their programs is dubious at best and harmful at worst . . . One frequent question I get is, “Why can't gay activists simply leave 'ex-gay' groups alone and let them go about their business?” This is exactly what happened for nearly three decades while “ex-gay” groups labored in near anonymity. But all this recently changed when the “ex-gay” groups intricately aligned themselves with the anti-gay political agenda of the Religious Right. With “ex-gays” added to their arsenal, the Right could disingenuously claim to love gay people and offer them “hope for change,” while simultaneously fighting for punitive legislation. Their insidious message: Since gays and lesbians can change, there is no need for laws that protect them against arbitrary prejudice. 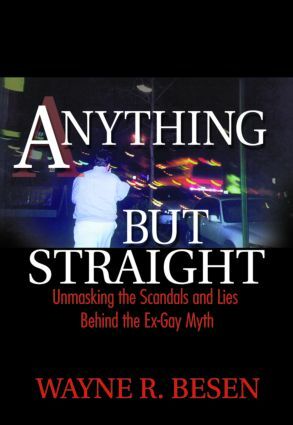 Anything but Straight: Unmasking the Scandals and Lies Behind the Ex-Gay Myth is an essential read for activists on both sides of the “ex-gay” fence, family members of gays and lesbians, Gay, Bisexual, Lesbian, and Transgender church members, psychiatric and social science professionals, and anyone who has dealt with “coming out” issues. An appendix of resources and a helpful bibliography make it easy to find additional information on this fascinating topic.